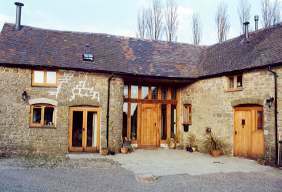 Tom and Barbara Norris moved from Court Farm to this luxurious barn conversion which is on the farm of 325 acres, farming beef cattle, sheep and cereals. The Norris family has lived in the area for over 500 years - continuity that is reflected in the sense of rural tradition that is a feature of Gretton Court atmosphere. The rural situation is ideal for sightseeing, walking and relaxing, with the rolling countryside of the Shropshire hills all around. A warm, friendly welcome awaits you with complimentary afternoon tea on arrival. The house is luxuriously appointed with a wealth of exposed timbers, including oak panelling, a large log-burning inglenook fireplace, full central heating, fitted carpets and antique furniture. 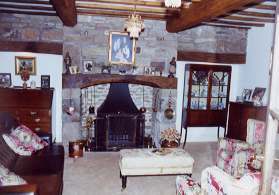 Guests lounge and separate dining room. One double room with brass bed and hangings with a shower bathroom. One twin room with bath and shower. Razor points, hair dryer, beverage making facilities, T.V. and radios in both rooms. Gretton Court, in the hamlet of Gretton, is situated in the heart of the countryside just outside the village of Cardington. It is within easy distance of all the most interesting places in Shropshire: Ironbridge Gorge, Shrewsbury and Ludlow are each about 15 miles away. There are excellent places to eat less than 10 minutes away from the house - menus available in guest rooms.